THE Sinn Fein Lord Mayor of Belfast will tonight host a reception in recognition of the service of bus drivers during the Troubles – almost 40 years after his father was convicted of hijacking one of their vehicles at gunpoint. The bus driver, father-of-three Sydney Agnew, was shot dead by republicans in 1972 to stop him testifying. Tonight’s reception comes only days after Niall O Donnghaile made international headlines for refusing to present a Duke of Edinburgh Award to a 15 year-old girl because she was also an Army cadet. He later apologised. Ulster Unionist Councillor Jim Rodgers said he had been aware for some time that the Lord Mayor’s father had been one of several men convicted of hijacking and burning a bus at gunpoint. “My own late father worked as a bus conductor, both for Belfast Corporation and Citybus; two of my father’s brothers also worked for the same organisations and my grandfather was the manager of Mountpottinger tram depot,” Mr Rodgers said. “I don’t think the Lord Mayor should be participating in this reception because his father was convicted of this serious offence. However, a Sinn Fein spokesman said the Lord Mayor would not step aside and would host tonight’s event. “The mayor’s father was convicted of hijacking a bus 40 years ago,” Sinn Fein said. Trade union Unite, which will be representing bus drivers at tonight’s reception, declined to comment on the issue. Bus driver Mr Agnew was shot dead on January 18, 1972. According to the book Lost Lives, his six-year-old son answered their front door to two 16-year-old youths, who asked if his father was a bus driver. Mr Agnew pushed his son and 10-year-old daughter aside and was shot several times. He was to be the principal witness in a case the next day in which a number of Short Strand men were charged with ordering him off his bus at gunpoint and burning his bus. 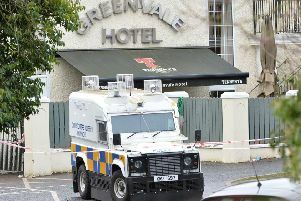 The coroner said the main aim of the shooting was to impede the course of justice. The killing was cited by Lord Diplock as an important case in the decision to abolish juries in Troubles-related trials. Ahead of tonight’s event, Metro bus driver and Unite union spokesman Michael Dornan said drivers were often seen as an “easy target”. Being forced by terrorists to transport proxy bombs was a particularly deadly risk, but they all ran the gauntlet of widespread civil disorder, he said. On Bloody Friday, July 21, 1972, the IRA detonated 22 bombs in Belfast, killing nine people. Four of them were Ulsterbus employees.